Be the first to share your favorite memory, photo or story of Rose . This memorial page is dedicated for family, friends and future generations to celebrate the life of their loved one. 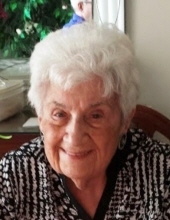 WINSTED - Rose Dennerlein passed away on Saturday, January 19, 2019 at the age of 93. Rose was born on July 5, 1925 and raised in Brooklyn, NY. She and her late husband, Albert G Dennerlein moved to North Haledon, NJ, where she was a devoted mother to her 4 children and husband. After retiring as a keypunch operator at Haband, in Prospect Park, NJ, she lived in Silver Ridge Retirement Community in Toms River. Rose moved to Winsted, CT in 2005. Rose was known to be a stellar Italian cook, baker, and card shark. She volunteered at the Valley Thrift Shop, and was an active member of the McCarthy Senior Center and Italian American Club in Winsted. Rose is lovingly remembered by her children, Albert, Judy, Robert and Roseann, her daughter in law Kristy, her sister Sally, her sister in law Rosalie and many nieces and nephews. She was preceded in death by her husband, Albert G Dennerlein and her brother Stephen D’Angelo. Much appreciation is extended to Foothills Visiting Nurse hospice staff for the excellent care provided, for the support of numerous friends, and the volunteers/staff of St. Joseph’s Parish. Friends may call on Tuesday, January 22, 2019 at Montano-Shea Funeral Home, 922 Main St., Winsted, CT from 4 -6 PM. A Mass of Christian burial will be held on Wednesday, January 23, 2019 at St. Joseph’s Church, 31 Oak Street, Winsted, CT at 11 AM. Burial will be private in New Jersey. Memorial donations may be given to: St Josephs Parish, 31 Oak Street, Winsted, CT 06098 http://www.stjoseph-winsted.org/donate.html and/or Fr Cedric Ministries: Live with Passion! 430 Bunker Hill Rd, Houston, TX 77024, https://frcedric.org. Visit an online guestbook at Montano-shea.com. To plant a tree in memory of Rose R. Dennerlein, please visit our Tribute Store. "Email Address" would like to share the life celebration of Rose R. Dennerlein. Click on the "link" to go to share a favorite memory or leave a condolence message for the family.